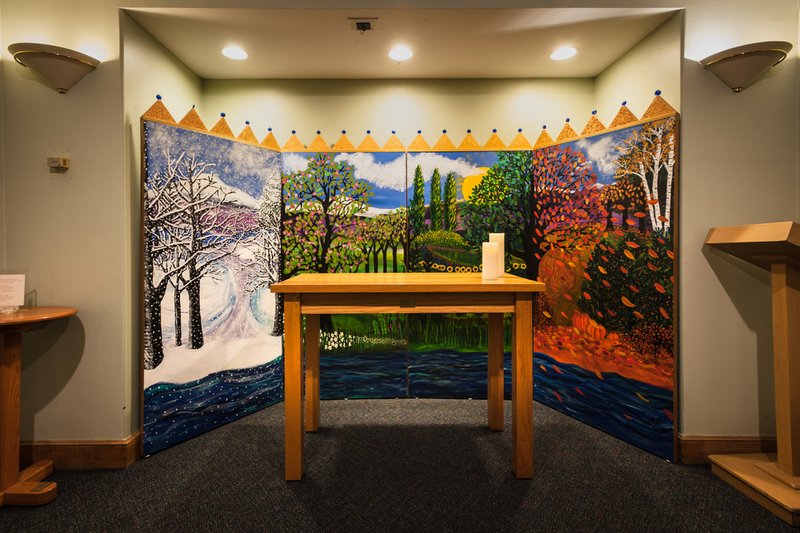 The chapel at Children’s Hospital in Boston has been offering quiet respite since it was initiated by nurses during the hospital expansion in the 1950s. Catholic mass, Sabbath candle lightings, Buddhist meditation, Muslim prayers five times a day, and other gatherings are held regularly in the space. A sign over the door that reads, “In quietness and in confidence shall be your strength” welcomes patients, families, and staff for quiet prayer, meditation or just a place away from the busyness of hospital routines. Visitors can explore images of worshippers and sacred places from a range of religious traditions in the hallway just outside. 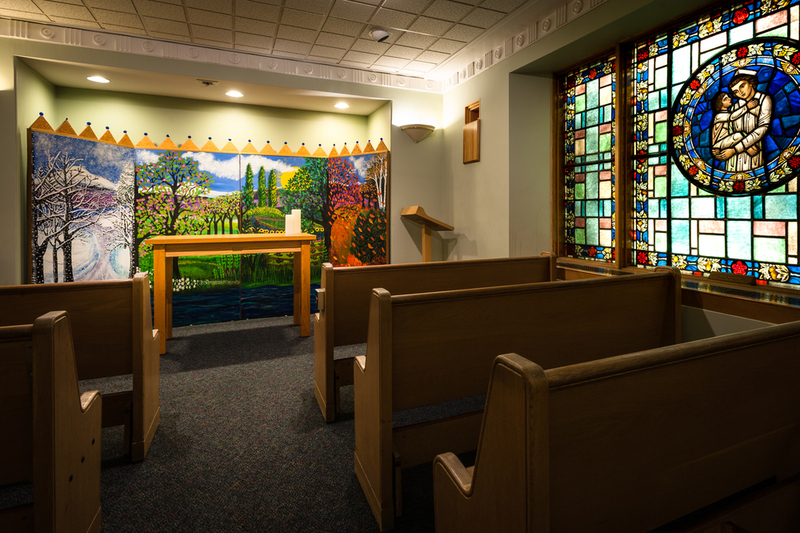 “In many ways, the hospitality and use of the chapel is indicative of our changing patient and staff populations, and our commitment to respectful interfaith relationships,” explained director Mary Robinson, a board certified chaplain and ordained minister in the United Church of Christ. The space is quiet even as patients, family members and visitors pass through. The chapel itself has changed over time from a traditional Judeo-Christian space to one that aims to welcome people from a range of religious backgrounds. When Robinson, the current Director of Chaplaincy, first visited the chapel in 1990 it was primarily a Christian space with Roman Catholic imagery behind the altar. In 1991 she helped transition it to a multi-faith space. The crucifix was removed and replaced with a commissioned screen without religious imagery and acceptable to Muslims (it had no animals or people on it). The use of the chapel by Jews, Muslims and Buddhists increased following these changes. Years later, different religious symbols were connected to a pulley system at the front of the chapel and moved into place depending on who was using the space. Today there are few permanent religious symbols in the chapel but many that can be moved in and out as needed. Tabernacles holding communion for Catholic and Protestant visitors are in one area while Muslim prayer rugs and books from multiple religious traditions are in another. A stained glass window depicting a nurse and child has been present from the start- donated by a family whose son died at the hospital in 1955– and pews in the space came from the House of the Good Samaritan, a hospital that cared for poor children in Boston for one hundred years before merging with Children’s. 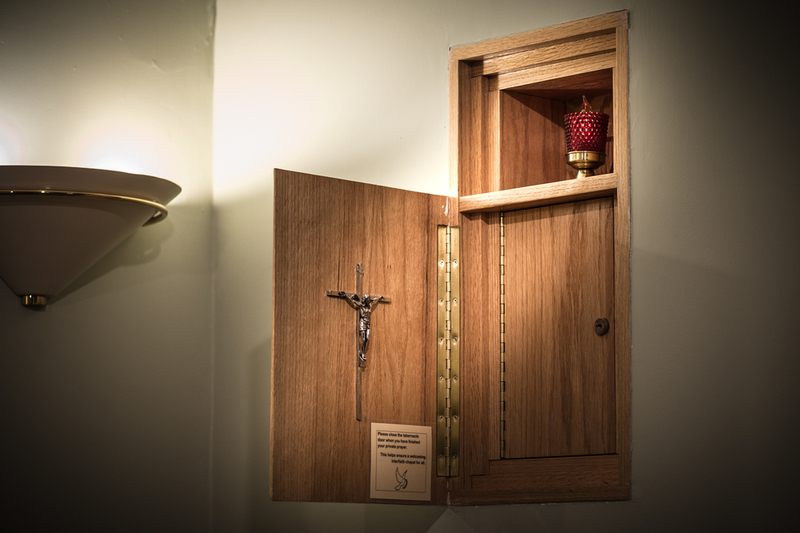 About fifteen people leave prayers in the prayer box each day. Prayers are increasingly from people who are spiritual but not religious and not connected to religious congregations. Take a tour of other spaces in the Longwood Medical Area.